Omar Khayyám (Persian عمر خیام; May 18, 1048 – December 4, 1131) was a Persian poet, mathematician, and astronomer. During his own life he was primarily known for his ingenious work as a scientist; Khayyám contributed a number of insights to the development of geometry, algebra, and other fields of mathematics. He also revolutionized the field of astronomy by proving that the earth-centric theory of the cosmos was fundamentally flawed. Almost all of Khayyám's contributions to science would eventually find their way into the Western hemisphere. Today, however, Khayyám is primarily known as a poet, and particularly for the volume The Rubaiyat of Omar Khayyám, famously translated by the nineteenth-century English poet Edward Fitzgerald. Khayyám's poetry, written in rubaiyat, or quatrains, which tend to rhyme in an "aaba" rhyme scheme, is memorable not only for the beauty of its language and the concise gracefulness of the rubaiyat form, but also because the poems give the reader a glimpse at a mind of profound complexity and intelligence addressing fundamental issues of faith, doubt, and morality. As a brilliant scientist and devout Muslim, Khayyám struggled to find the balance between rationality and religion, a struggle which forms the principle topic of Khayyám's poetry. Although he was virtually unknown to Western audiences until nearly a millenium after his death, Khayyám is now universally acknowledged as one of the most profound and important poets of the Middle East. Khayyám is thought to have been born into a family of artisans in the city of Nishapur. He spent his childhood in the town of Balhi, studying there under the tutelage of Sheik Muhammad Mansuri, one of the most well-known scholars of the time. Later, Khayyám studied under Imam Mowaffak of Nishapur, who was considered one of the greatest teachers of the region. Two other exceptional students began studying under the same teacher at about the same time. One of these was Nizam-ul-Mulk, who went on to become the Vizier to two rulers of the Persian Empire. The other was Hassan-i-Sabah, who went on to become the leader of the Hashshashin. It was commonly believed that any young man who studied under that eminent Imam would attain honor and happiness. These three students, who became friends, each pledged to one another that whichever of them received fortune, he would share it equally with the other two. After Nizam-ul-Mulk became Vizier, Hassan-i-Sabah and Omar Khayyám each went to him, and asked to share in his good fortune. Khayyám made a very modest request, asking not for an office or fame, but simply a place to live, study science, and pray. He was granted a yearly pension of 1,200 mithkals of gold from the treasury of Nishapur. He lived on this pension for the rest of his life. Khayyám was famous during his lifetime as a mathematician, well known for inventing the method of solving cubic equations by intersecting a parabola with a circle. Although this approach had earlier been attempted by Menaechmus and others, Khayyám provided a generalization extending it to all cubics. In addition he discovered the binomial expansion, and authored criticisms of Euclid's theories of parallels which made their way to Europe, where they contributed to the eventual development of non-Euclidean geometry. In 1070 C.E. he wrote his great work on algebra. In it he classified equations according to their degree, giving rules for solving quadratic equations which are very similar to the ones we use today, and a geometric method for solving cubic equations with real roots. He also wrote on the triangular array of binomial coefficients known as Pascal's triangle. In 1077 Khayyám wrote Sharh ma ashkala min musadarat kitab Uqlidis (Explanations of the Difficulties in the Postulates of Euclid). An important part of the book is concerned with Euclid's famous parallel postulate, which had also attracted the interest of Thabit ibn Qurra. Khayyám's attempt at proving this difficult postulate was a distinct advance over those of his contemporaries. Khayyám also did other notable work in geometry, specifically on the theory of proportions. 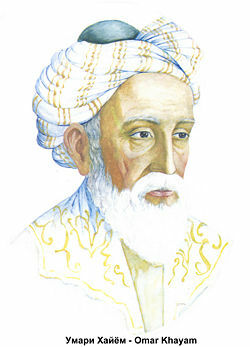 Khayyám was also famous as an astronomer. In 1073 the Malik-Shah, sultan of the Seljuk dynasty, invited Khayyám, along with various other distinguished scientists, to build an observatory. Eventually, Khayyám measured the length of the year with extraordinary accuracy as 365.24219858156 days. This calendar measurement has only a 1 day error in every five thousand years, whereas the Gregorian calendar used today, has a one day error in every 3,330 years. Khayyám also estimated and proved to an audience that the universe is not moving around earth as was believed by all at that time. By constructing a revolving platform and simple arrangement of the star charts lit by candles around the circular walls of the room, he demonstrated that earth revolves on its axis, bringing into view different constellations throughout the night and day. He also elaborated that stars are stationary objects in space which if moving around earth would have been burnt to cinders due to their large mass. All these theories were adopted centuries later adopted by Christian astronomers. As a work of English literature Fitzgerald's poetic version is a high point of the nineteenth century. As a line-by-line translation of Khayyám's quatrains, it is noted more for its freedom than for its fidelity. Many of the verses are paraphrased, and some of them cannot be confidently traced to any one of Khayyám's quatrains at all. Fitzgerald indisputably distorted the eleventh-century original by adding his own nineteenth-century Romantic sentiments, and some more recent translations of Khayyám's poetry are not nearly as sentimental or overwrought as Fitzgerald's version, revealing a poet of stark intelligence and concise language. Nonetheless, Fitzgerald's version remains the most familiar (and most widely imitated) of Khayyám translations. Some critics jokingly refer to the Fitzgerald's English versions as "The Rubaiyat of FitzOmar," a practice that both recognizes the liberties Fitzgerald took with his source but also the credit Fitzgerald deserves for the considerable portion of the "translation" that is his own creation. In fact, Fitzgerald himself referred to his work as "transmogrification." Some people find this quite unfortunate, while others see Fitzgerald's translation of the work as close enough to the true spirit of the poems to warrant the liberties taken. Bashiri, Iraj. Ghiyas al-Din Abul Fath Umar ibn Ibrahim Khayyam Nishapuri. Retrieved October 16, 2013. This page was last modified on 20 December 2018, at 16:27.